What better way to celebrate July 4th weekend than with some backyard fireworks! Luckily I had my JETBeam C8 Flashlight on hand to help light up the way. In order to put on a good show for my friends and family I needed the perfect setup. As we finished up dinner and daylight quickly disappeared I knew it was time to bring out the fireworks. I happily whipped out my JETBeam C8 and switched it to the 75 lumen “Low” mode since there was still some light left in the sky. This was perfect for unwrapping the fireworks on the deck and walking them over to the backyard. In a matter of minutes it was completely dark outside so I knew I needed to kick it up a notch. Now it was really time to show off the power of the JETBeam C8 Flashlight. I skipped right over the 260 lumen “Mid” mode and switched to the mind blowing 1,000 lumen “High” mode. I aimed the C8 at the fireworks where I had my brother-in-law helping me set them up (see picture below). 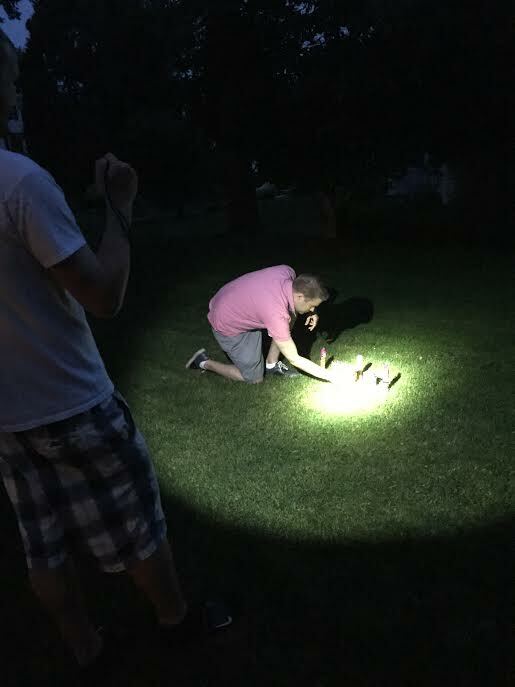 As soon as I switched to the 1,000 lumens my brother-in-law yelled out “Holy cow!“…He’s never seen a flashlight produce that much high quality light before. In fact, everyone that was at my house was in complete shock of the overwhelming power that this compact flashlight was capable of. It made setting up the fireworks (which is generally a very tedious project) more enjoyable than ever. Normally I would have just used my cell phone light or a dinky flashlight but now that I have experienced the pure quality and high performance of the JETBeam C8, there’s no going back. 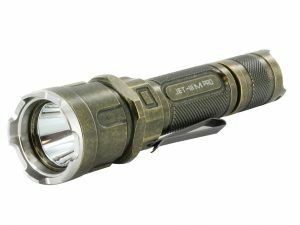 This all purpose flashlight provides you with an incredible lighting experience that cannot be out done. Surprisingly after the firework show was over my friends and family were asking to try out the flashlight for themselves. I showed them all 3 output modes as well as the strobe mode. They were shining the beam on the trees, the wood pile, the swing set, the picnic table and anything else that was submerged in darkness. I’ve never seen a bunch of adults get so excited over a flashlight before. At least I won’t be struggling to come up with birthday gift ideas in the near future. This flashlight will do just the trick. The convenience, affordability and versatility makes the JETBeam C8 perfect for any type of situation. Like what you heard about the JETBeam C8 Flashlight? Please let us know in the comments section below!